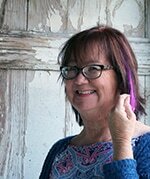 The pink tulip grapevine wreath makes me do the happy dance. 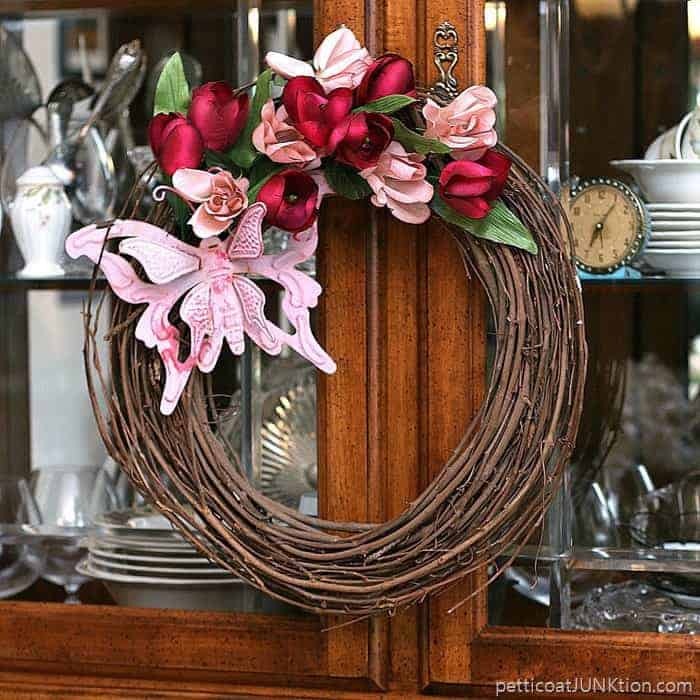 Spring is just around the corner and this wreath has Spring written all over it. I do the happy dance when a project turns out well, or better than I expected. I almost called this project “The Happy Dance Wreath”. 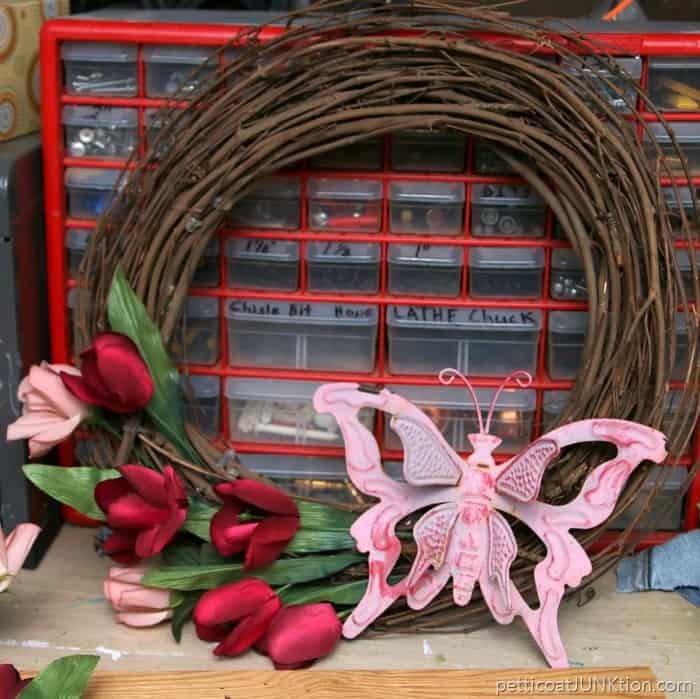 Today is thrift store decor day and this is one thrifty wreath. The two flower stems are finds from a thrift store in Arkansas. I haven’t posted about the goodies I found in Arkansas yet. 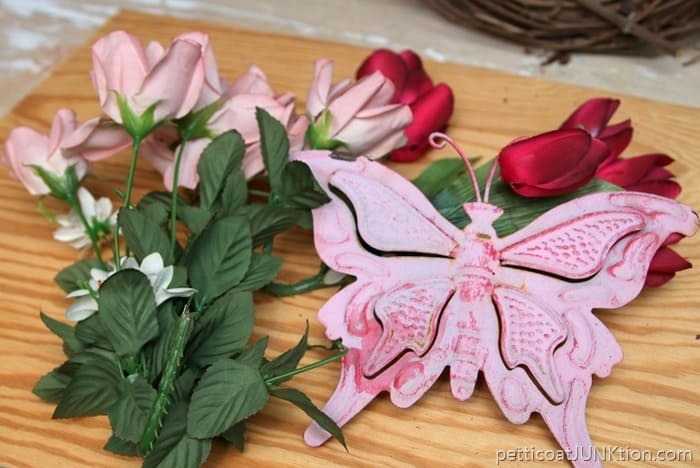 The flower stems were 50 cents and the butterfly from “I can’t remember where” was only 50 cents or a dollar at best. The grapevine wreath was a thrift store find and a steal at 99 cents. So the cost of the wreath is approximately $2-$3. Not bad. 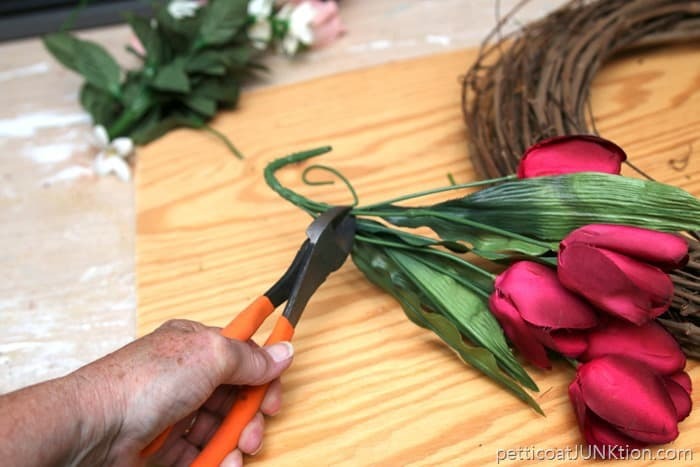 The first step in the wreath making was to cut the flower stems apart with a pair of wire cutters. 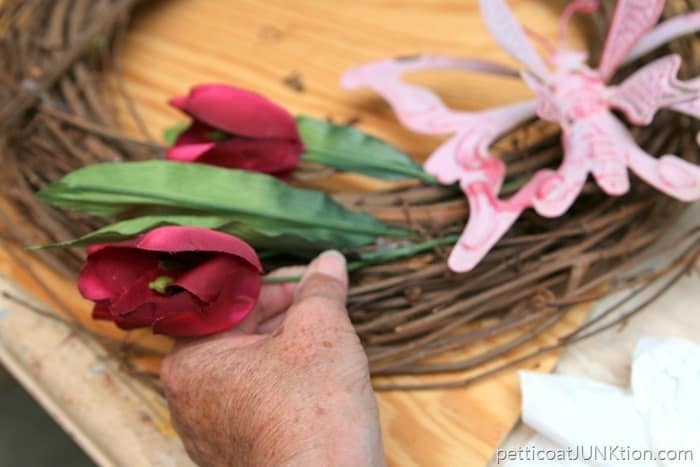 Then stick the flowers into the grapevine wreath. Just put them in there till you think they look nice. Then stand back and look at it. No, that doesn’t work. Sooooo, let’s rotate the grapevine wreath and turn the butterfly 180 degrees. Better. Now I just have to fill in a few spaces and it’s ready for the next step. After filling in the flowers here and there and perfecting the look I got out the hot glue gun. It was stuck to the stainless steel can I use to corral it and the hot glue when working on a project. I couldn’t pull it out no matter how I tried. 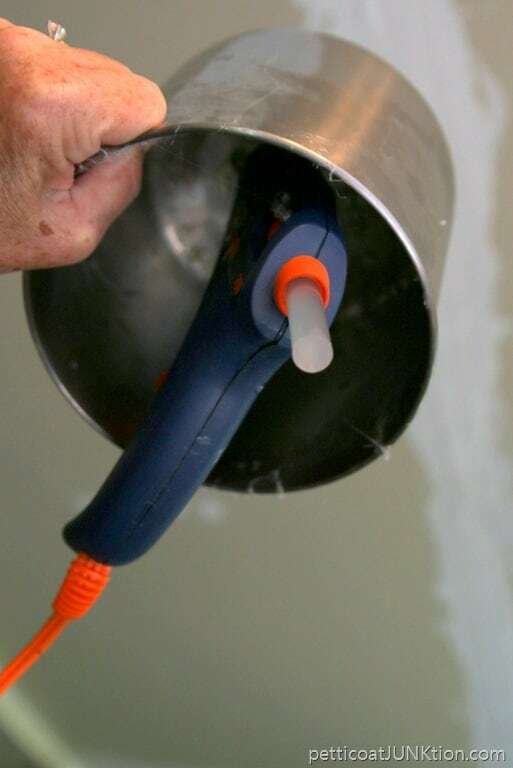 I plugged it up and let the wax melt until I could pull the glue gun free. The hot glue step isn’t as easy as it looks. You have to be careful not to get the glue all over the place. It will stand out like a sore thumb. Make sure you get the glue on the underside of everything. 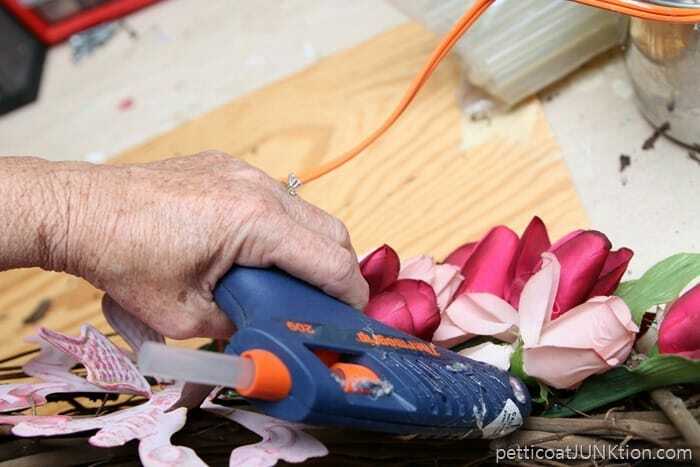 You will need to turn the wreath up and down and backwards to get the flowers glued into place. The butterfly is made out of metal and has a bent wall hanger thingy on the back so I just hung it on a couple of the vines. Worked great. 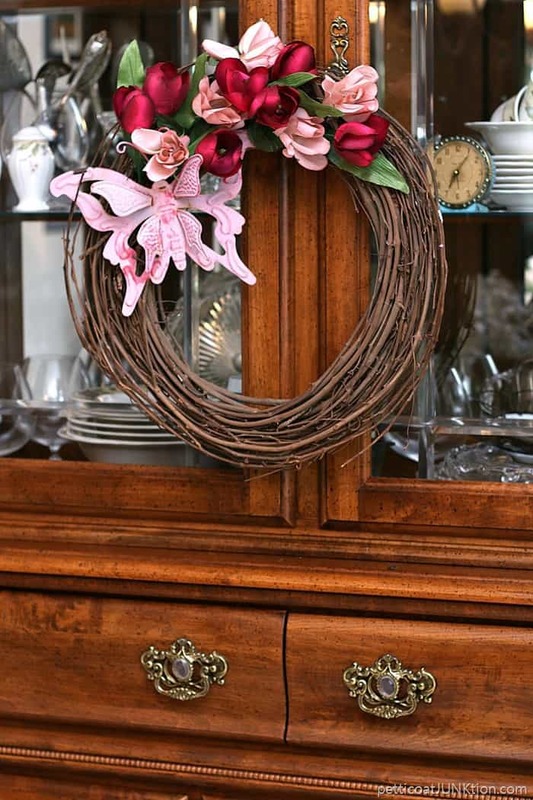 The wreath is hanging on my china cabinet doors. I think I’ll take it to Arkansas next trip and change out the wreath on Mom’s door in the nursing home. Those inexpensive flowers look really nice. 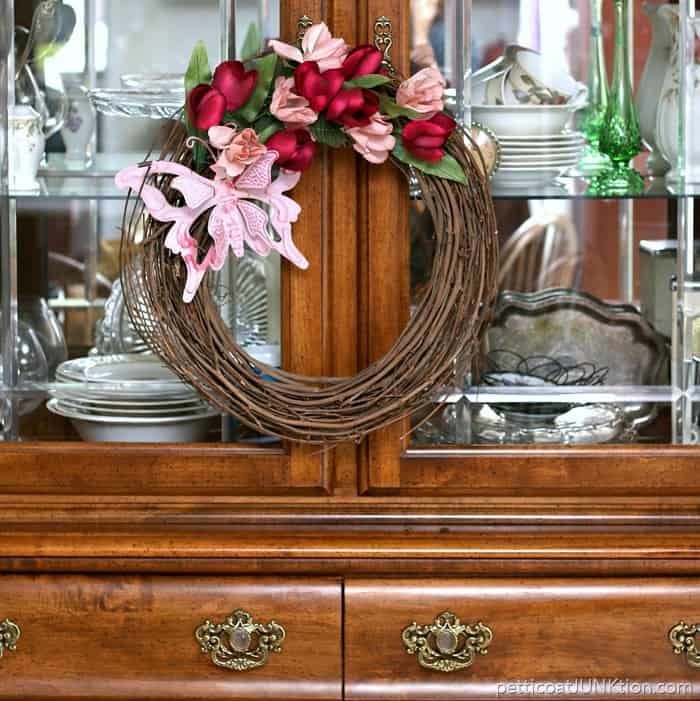 How about the wreath on the china cabinet doors? What interesting spots have you found for wreaths? Time to visit my thrifty friends. 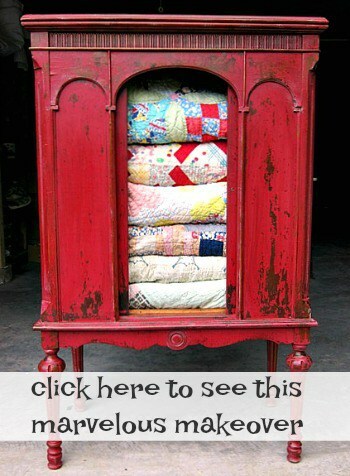 Just click the pink text links below the “before” photos…..
Great! How pretty the wreath looks. Thanks for your articles. 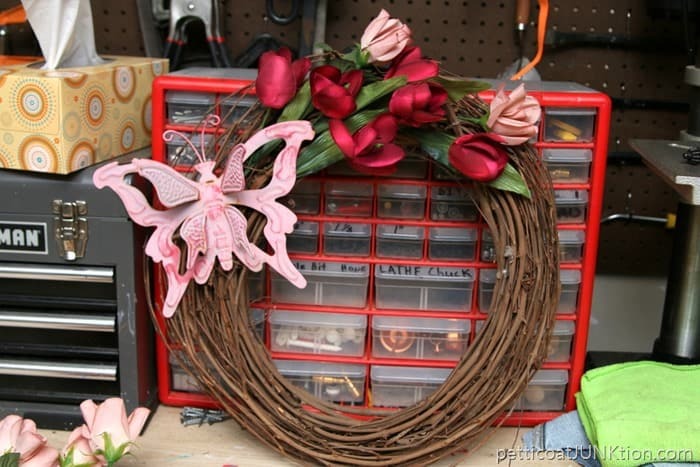 A wreath after my own heart – easy, inexpensive, and makes you do the happy dance! Your Mom and staff at the nursing home will love this wreath I’m sure. To answer your question, the joy of wreaths is that they go anywhere besides doors. 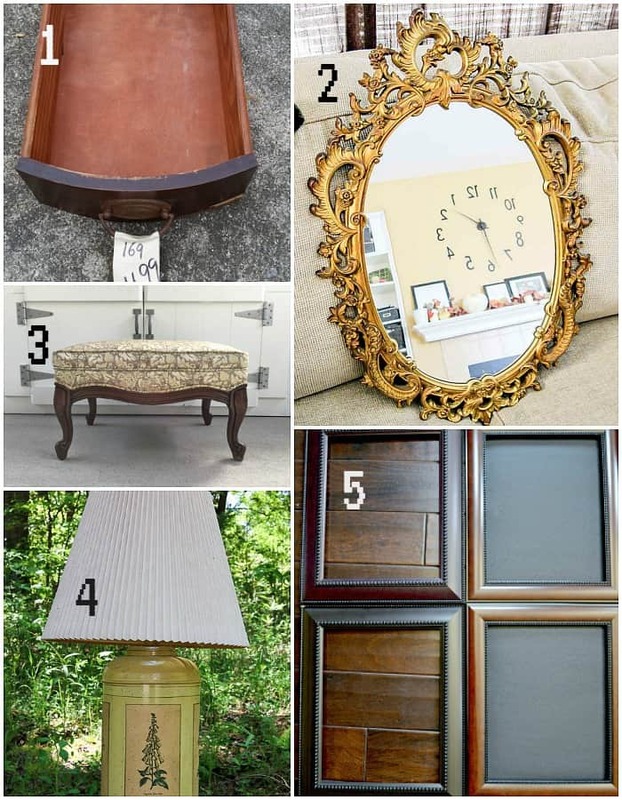 Mirrors, backs of chairs, draped over chairs, mantels, tablescapes, windows, hangong on fence gates, and the list goes on. Super cute – perfect for spring/summer! 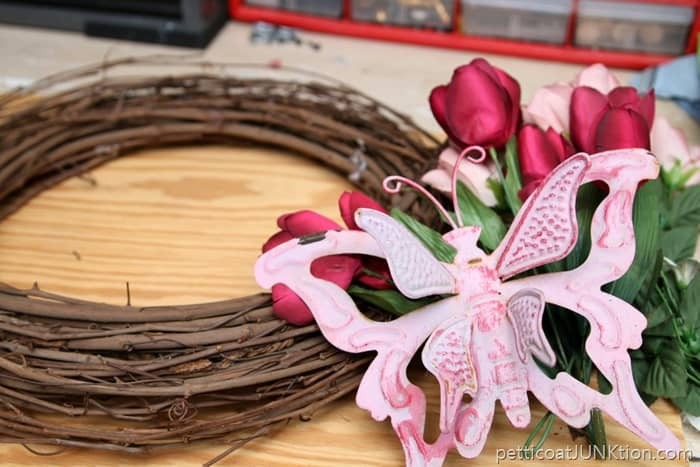 What a cute wreath and I happen to have a metal butterfly so thanks for the idea, will have to try it soon. This turned out so pretty, perfect for summer! What a good looking wreath. Would not have thought to use pink and red but it is gorgeous.